The discussion for the best boundary microphones rarely come up when there is a discussion about the different types of microphones for studio recording despite being very unique. If you are looking for a mic that can take sound from an entire room, this is the type of mic to go for.They're particularly best when recording meeting discussions and also used in studios. They are mounted on walls or in ceilings or kept on floors several feet away from the targeted source. Another advantage that the boundary mics have over other types of microphones is that they are less susceptible to comb filtering. Comb filters are sound signals that are delayed and added back to themselves. 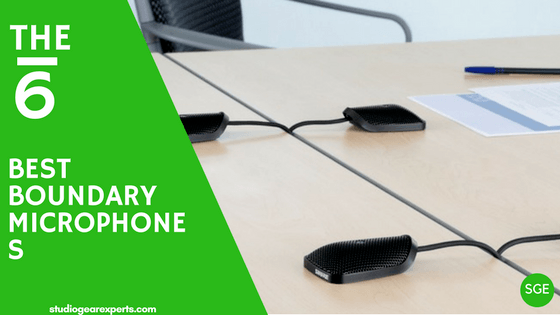 Boundary microphones are commonly used in conference rooms and theater halls. In the music recording studios, they can be used as room mics while being mounted on the walls or desktops. Again, they are also commonly used to mic pianos by laying them in the grand. They can also be used to mic kick drums where you just lay them in the shell. Similar to other types of microphones, you need to consider their polar patterns (cardioid, omni, and bidirectional) depending on where and what source/sources you intend to mic. You should also consider its signal-to-noise ratio and SPL capabilities. There are also USB boundary microphones like the omni-directional Samson UB1 USB Boundary Microphone. Here we've picked the best boundary mics for different applications. Whether you're looking one for piano, theater or stage, we've one for you. As an industry leader in audio equipment, Audio-Technica is known for its outstanding recording studio gear. Its AKG C1000 S MK4 and AKG K 240 are amongst the best studio items that we have on our lists of the best small diaphragm microphones and best studio headphones for 2017 respectively. It’s, therefore, not surprising that one of the best boundary microphones comes from this American brand. Audio-Technica Pro 44 is a cheap boundary microphone that comes under the 100-dollar price point. It’s a low-profile microphone ideal for places where minimal visibility of the mic is required. It's common in podiums, lecterns, and conferences. It can also be used in recording studios to mic instruments especially the piano. The Pro 44 utilizes a wide-range condenser element and has a low-mass diaphragm that is responsible for its high signal-to-noise ratio of 66dB (1 kHz at 1 Pa). This boundary microphone’s superior performance is also contributed by its wide dynamic range of 86dB and its 70-16000Hz frequency range. It also has 114dB of SPL handling which is average for a boundary mic at this price range. Worth pointing out, Audio-Technica Pro 44 comes with a 25ft cable that offers lots of flexibility on mounting options. It can also be powered by any phantom power source with 9-52V DC. No list of the studio microphones would be complete without a piece from Shure. While this manufacturer’s SM57 and 58 are amongst the best dynamic microphones of all time, their Shure MX391, on the other hand, is one of the best boundary microphones below 200 dollars. Like most microphones from this brand, Shure MX391 is not an exception regarding quality sound performance. In fact, this is one of the most advanced units on this list. First, its low-profile makes it ideal for instances where complete unobtrusiveness is vital. Secondly, the MX391 is supersensitive to audios thereby making it amongst the best mic for conference and boardroom microphones. Another amazing feature with the MX391 boundary microphone is that it’s available in different polar patterns. You can choose between any of the 3 major directionalities; cardioid, super-cardioid, and omnidirectional. For studio recording, the omnidirectional polar pattern will add some of the room’s ambiance for more natural projects while the cardioid is ideal for isolating sound sources. This mic’s frequency response from 50 to 17,000 Hz has also been tailored to pick up the best from human speech without any unwanted coloring. It also has a high signal-to-noise ratio (71.4dB) and an acceptable SLP capability too at 118.8dB. Another mic known for its boundary effect is Shure Beta 91A Kick Drum Microphone, which is a Half-Cardioid Condenser mic for bass instruments and kicks drums. Are you in need of a boundary microphone for recording drums? This Germany-made tank will mic not only your kick drums but cajon and piano too. Quite different from the MX391 and Pro 44 microphones above, Beyerdynamic TG D71C is purposely made for these low-frequency instruments. This means that you’re not forcing things here. And it’s just a little over 200 dollars. Here is why you need it today. First up, TG D71C is a tank by itself. This mic has a metallic housing construction and a compact design to help it withstand being roughed up on the stage on a daily basis. Its bottom features a rubber padding that makes mounting the easiest thing ever. In fact, it does not require any specialized mounting. All you do is place it in the drum. Its rubber foot will keep it from sliding. It also offers permanent mounting option if need be. Designed basically for low frequency and percussion instruments, the Beyerdynamic TG D71C boasts 25Hz-20 kHz frequency response, half-cardioid polar pattern, and an onboard pre-amp. Moreover, it has the highest Sound Pressure Level handling capability at 148dB and 63dBA signal-to-noise level. Crown PCC-160 is one of the most used boundary microphones on the market today. It’s a professional boundary mic used in lecterns, news desks, conference tables and stages where mic stands are a no-no. It’s also a great home studio boundary microphone that can be used to mic drums and pianos. On stage, it makes it a breeze to record choirs, plays, and orchestras. So, what makes Crown PCC-160 an industry-standard microphone? This microphone scores highly in terms of low profile. It’s also very rugged to offer you years of use and value for your money. It’s crafted from heavy-gauge steel and will doubtlessly withstand regular abuse. It can either be mounted temporarily or permanently through the screw holes. This microphone also has self-contained electronics in its circuitry. As such, you don’t need to connect it to an in-line preamp box. About performance, the PCC-160 utilizes PCC (Phase Coherent Technology) that makes it easy to use on large boundary surfaces. This technology uses a small supercardioid capsule that boosts the microphone’s gain-before-feedback and also rejects off-axis sounds and unwanted room noise. The small capsule also ensures clarity even at the highest frequencies. It also offers a wide dynamic range with smooth frequencies from 50Hz to 18 kHz free of distortion. Sennheiser has some of the best bass microphones. Their Sennheiser E604 (featured in our other work of the best bass mics for kick drums) is amongst the most affordable bass microphones you can hike up your home studio with. Sennheiser also brings one of the best high-end boundary microphones for kick drums at a very affordable price point. The e901 is mostly sought after due to its excellently defined and detailed sound reproduction. This microphone is fitted with a pre-polarized condenser for natural sounds with fast transient response. Its 20 - 20000 Hz frequency response has been optimized for use on professional live sound applications and in studio on kick drums, pianos, percussion, and other low-frequency applications. The e901 uses a half-cardioid polar pattern for fast and realistic sound transmission from kick drums. This directionality also increases gain-before-feedback and also minimizes distortion from stray signals. It offers a unique balance of low and high frequencies with a good amount of bottom and also has enough amount of attack. It’s also capable of handling signals with high Sound Pressure Levels of up to 124dB and has 0.5 mV/Pa sensitivity. Without forgetting, this boundary mic comes with a 10-year warranty. Crown PZM30D is Crown’s most popular boundary microphones. This is a Pressure Zone Microphone (PZM) commonly used in conferences, interviews, broadcasts, lectures, and group discussions. It’s also one of the best home studio boundary microphones especially for video production and audio recording. Though a bit pricey, the PZM30D microphone is renowned for its clean high frequencies ranging from 20Hz to 20kHz. This mic utilizes a hemispherical polar pattern (half omni) when mounted on a large surface. It also has a wide dynamic range of up to 99dB and consistent pick up of sounds. Worth pointing out, Crown PZM30D is good in minimizing vibration effects and noise. Its signal-to-noise ratio is rated at 73dB at 73dB SPL. It has a balanced output and low impedance (150 Ohms) which enables the cable to transmit the sound with almost zero hum and reduced loss of high frequencies. The PZM30D uses and XLR cable and requires phantom power from either a mixer or interface. There you have it folks; a list of 6 of the bestselling boundary mics for this year. For our new visitors, this article is a continuation of our series on 10 different types of microphones. Whether you’re in need of the best dynamic, condenser, bass, or ribbon microphones, Studio Gear Experts has some of the best options for you.